Why is this "Never Ending"? "It is important to understand that the Never Ending trademark is reference to the fact that the Plasma Energy emanating from these vials does not deplete over time. TheGANS are magnetic fields given off by specific elements, herbs, chemicals, foods and other natural elements that have been condensed down to their fundamental molecular state. The plasma water contains the magnetic fields given off by the GANS." Click above link or HERE and be sure to view the testimonials and the blog pages. NOTE: The small vials are purchased once, and they "charge" the filtered/distilled water in the station (any clear class or plastic container). When the station is half-empty, just add more water. Drink a couple of swallows 2 to 3 times a day of this water as you see fit. I also "magnetize" my water using a "magnetic water brick" that I obtained from Lyon Legacy long ago. I personally feel that it this has helped me with a recent UTI infection that seemed to recur a few weeks after taking antibiotics for it. After just drinking this water for a few weeks (8 ounces 3 times a day), my symptoms stopped, and so I asked for a lab report to be sure it was clear, and the lab results were normal. Also, this water tastes great... it seems smoother and thicker... more "alive". And I have more energy now. Attach the vials to the station of your choice with glue (hot glue gun, gorilla glue, whatever). If it will be in a 'busy' area put a row of clear packing tape over all the vials to prevent their being jarred lose. [PERSONAL NOTE: I just used clear tape to attach all 16 vials to my large glass jar.] People are using a variety of containers from clear glass ice tea containers that hold several gallons of water, to the see through water jugs that hold up to 5 gallons of water. Some prefer the tubs with lids as you see in the photo. It's your station and your choice! Be sure not to use metal, ceramic or opaque glass or plastic containers. The numbers on the vials are only there for Paul's use when filling the vials and do not have to be placed in any certain order on your station. Fill your plasma energy station with filtered water (or distilled if you don't have filtered). Be sure to put your intention on how you want your station to enhance the health and well being of you, your family, your pets and your plants. Let the water change overnight with the addition of the energy fields from the vials. Then it's ready to use. When the water goes to halfway, add more filtered or distilled water. For additional relief make patches using the water to place in areas of your body where you would like to help the body change the condition by using the energy fields. You can put some of the water from your jar into a sprayer and spray hats or scarves that you wear. Make a breathing device with the water from the vial and also make a spray bottle from the water to spray any areas of the body for which you want the energy fields to create the condition of bringing about change. You can add an extra rinse when you wash pillowcases and add one cup of this water to the rinse and let it sit for a couple of hours. This vial contains the plasma energy water from the Gans of Ancient Sacred Plant, Amino Acids, and hemoglobin. Drink up to l/2 cup of this water every day to enhance well being. The vial can be placed in or taped onto a large container like a quart jar to which you add distilled or filtered water. Prevented Amputation for Flesh-Eating Disease! On June 4, 2018 it was reported by a first-hand witness that a man's hand and arm was damaged in an accident, and contracted a type of flesh-eating disease known as "Mercer Disease" (MRSA). 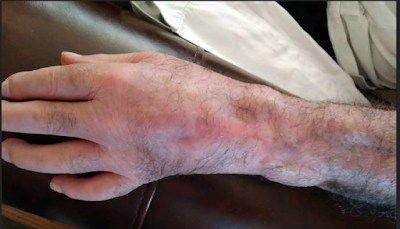 The doctors were going to amputate his arm in order to save his life. This witness was his personal friend and knew about this new product called "Silver Infusion", and suggested giving it a try. 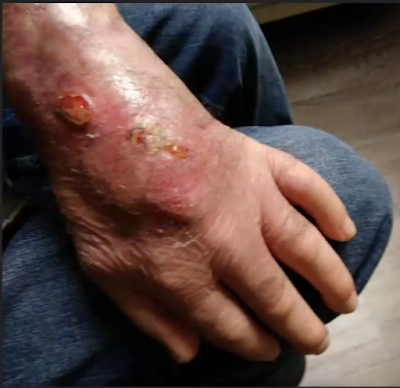 After only one week of drinking 1 quart per day (2-3 gulps per hour) of this silver-infused liquid, and also spraying it on the infected area 7-10 times per day, see below before and after snapshots of what happened to this man’s hand and arm! NOTE: This witness recommended trying this on other diseases too, like herpes, lime disease, neuropathy, toe fungus, knee pain, diabetes, inflamation, sunburn. 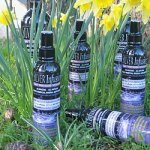 This solution is said to be 300 times more effective than typical coloidal silver solutions whose nano particles lose their ion charge over time and settle to the bottom of the bottle.